We caught up with a busy Paddy Cosgrave @paddycosgrave, Web Summit founder, just back from an Asian tour and now preparing for the next two events in Belfast, coming soon, MoneyConf and Enterconf. Irish Tech News will be bringing you extensive coverage of both events, but in the meantime we wanted to know how Collision went, and what tips Paddy had for Irish startups going forwards. How did Collision go? What worked well, what tweaks will you bring forward to the future events? Collision was an incredible success. We had 7,500 attendees spanning 89 different countries with 1,100 startups exhibiting over two days. Unbelievable. We heard many stories and the feedback was really positive – from the night events to the 300 volunteers who made their way from places like Russia and Hong Kong. Our PITCH stage worked really well. It involved two days of pitching across two stages in front of a diverse panel of judges. 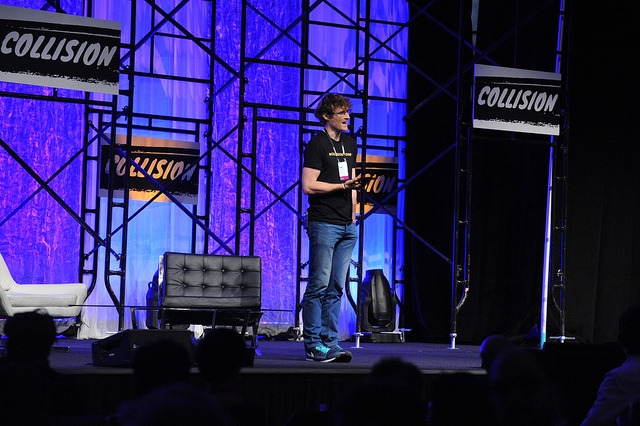 PITCH gave 60 of the most promising startups exhibiting at Collision a platform to tell their story. It was great to see the calibre of tech and innovators out there. We’re always working hard to build on our gatherings. It is important for us to use the feedback we get to influence our next event. On June 15 we host our first two vertical specific gatherings, MoneyConf and EnterConf. MoneyConf, our Fintech conference, brings together the Fintech leaders of today and the innovators of tomorrow who are building the money and payments technologies of the 21st century. EnterConf on the other hand focuses on enterprise software. This is aimed at addressing how software is changing industries and how businesses do business. Companies small and large from around the world will be at EnterConf to meet and learn from the software companies driving change. Engineered conference serendipity, how is the algorithm developing? Tell us a good news encounter that happened in Collision. We are committed to making our attendee experiences better and we tend to obsess over new ways to innovate. We want to create legendary networking at our gatherings and engineering serendipity plays a key part in this. It was in fact, our engineering algorithms which allowed us to generate 600 meetings between investors and startups across two days. There were many great stories from Collision, from the stages and across the venue. For example, Josh Tetrick from Hampton Creek spoke about disrupting food production by creating mass healthy, cheaper and safer resources for expanding populations. And the guys from GrabShare told us about meeting social media influencer Chris Voss in the drinks queue at our opening night party and ending up all over Twitter. How did the Irish startups get on in Vegas? We had 20 Irish startups join us at Collision such as Campsited, Crowdflow.io and File Expenses. The feedback was hugely positive but you should ask them. Some of the Irish startups got to take part in our office hours event. Your key tips for future startups looking to apply to attend to future Web Summit events? Firstly, get in early. For Collision, we had a 2 for 1 offer limited to the first 1,000 redemptions. Thousands applied, so be sure to get in early so you don’t miss out. If you are looking for investment, have a plan to pitch. Keep your story to a sentence that encompasses the nature of what you are doing and why it is important. Rehearse and anticipate questions. Also, know the venue. It will save you time and help you find the people you’re looking to meet. Prearrange meetings where possible and prepare in advance. Our event app is a great starting point! Finally hustle, hustle, hustle. Use your team effectively. Make sure you stand out. Strike up conversations with everyone and anyone.